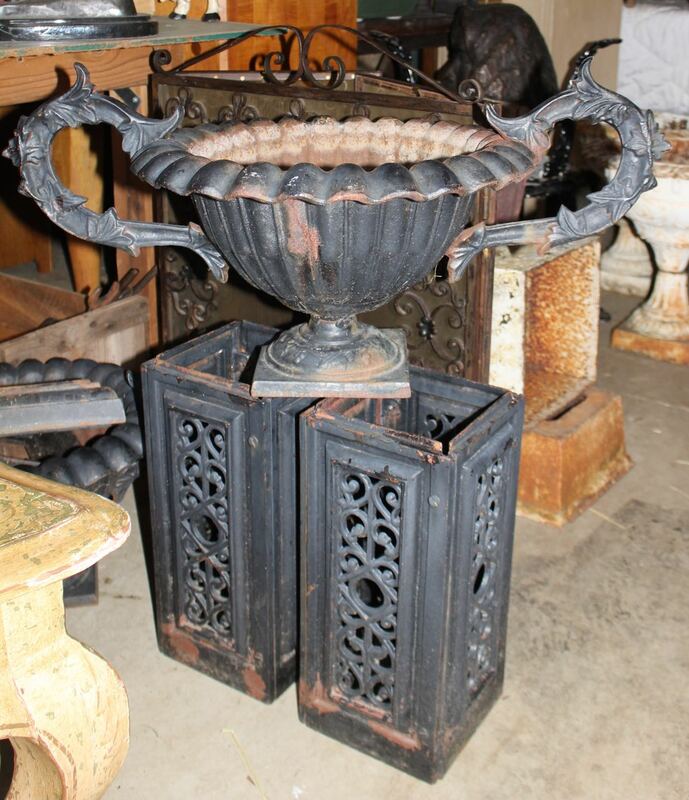 If you’ve been in our shop before, you know we have a passion for old garden pieces. We hunt for garden antiques year-round but we are especially focused on the hunt in the winter. Antique urns are becoming increasing hard-to-find but that doesn’t stop us–we just have to hunt harder and travel farther! We are currently stocking up (hoarding) cast iron urns, cast iron gates, patio furniture, trellises, arbors, bird baths, and statues. 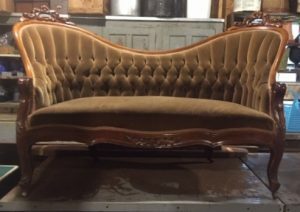 If you have pieces that you are interested in selling, let us know. 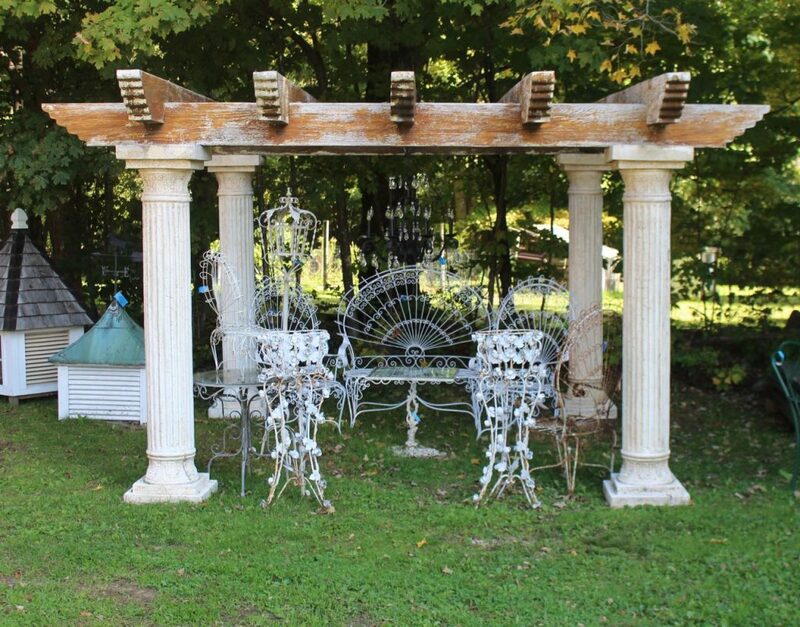 And if you’re looking for garden antiques, check back–our garden area will be set up as soon as weather permits! 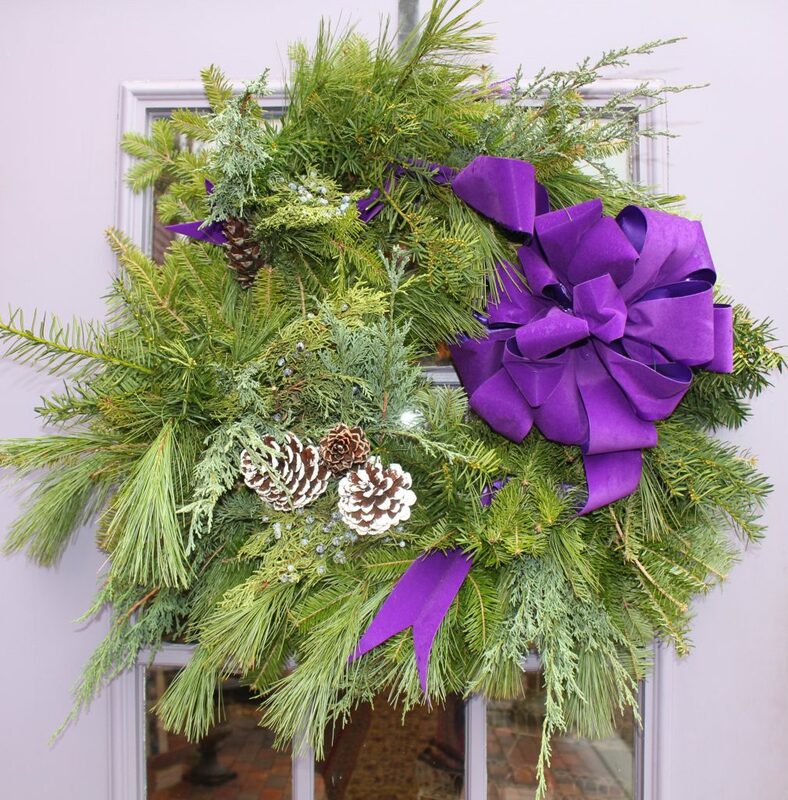 There are some New Hampshire shops that are seasonal but we are definitely NOT one of them! We are on the hunt 24-7-365 (as evidenced by the inventory I squashed into my van yesterday). We are open daily year-round and we are determined to bring in new inventory every single day so that our customers can enjoy a unique shopping experience each time they come in. 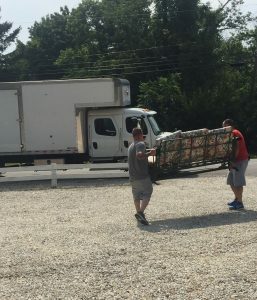 Yesterday’s house call took us to the home of some folks who are downsizing in preparation for a move. Their collection includes more than 30 butter churns and 50 pieces of antique lighting. Yesterday, we bought a beautiful dry sink, a small butcher block, and an old wooden wheelbarrow (yes, spring is coming). We will be heading back in another week or so to pick up a jelly cupboard and a hatbox dresser, along with the first batch of butter churns and lighting. So don’t let the weather fool you! 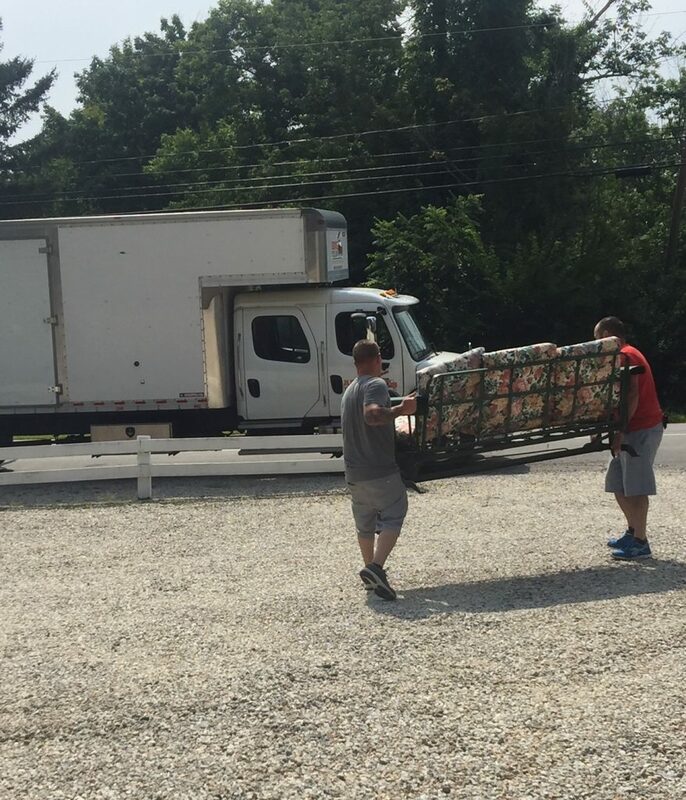 For us, the hustle never stops! Just a quick update with regard to holiday & winter hours. 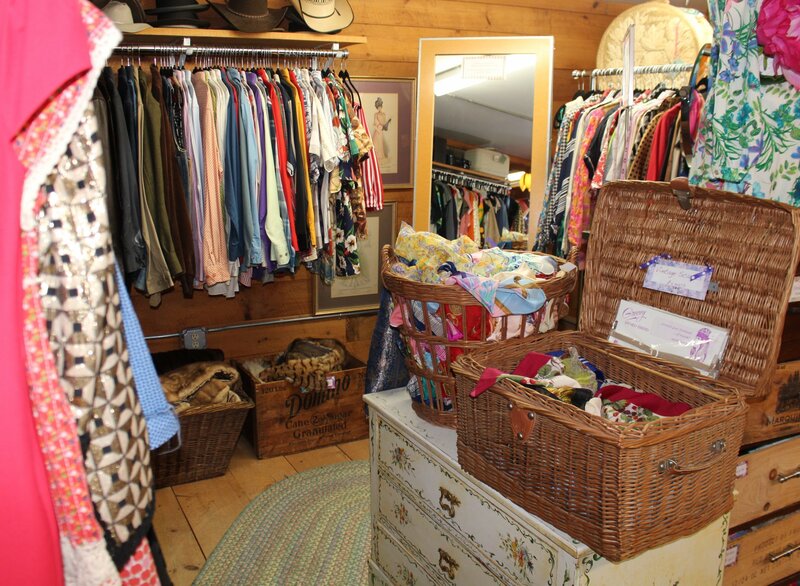 We are open year-round, 7 days a week from 10-5:00 (and the barn is open year-round as well so dress warmly). We will be open on Christmas Eve but we will be closing at 3:00; we will be closed on Christmas Day. We will be open on New Year’s Eve and on New Year’s Day. We base our snowstorm closures (as well as late openings and early closings) on the condition of our parking lot. We don’t open until we are plowed & shoveled and we close early if a storm is making our parking area slippery & unsafe. Don’t hesitate to call before you come! We wish you all Happy Holidays and we look forward to seeing you this season! Butler’s on the Big Screen Again! 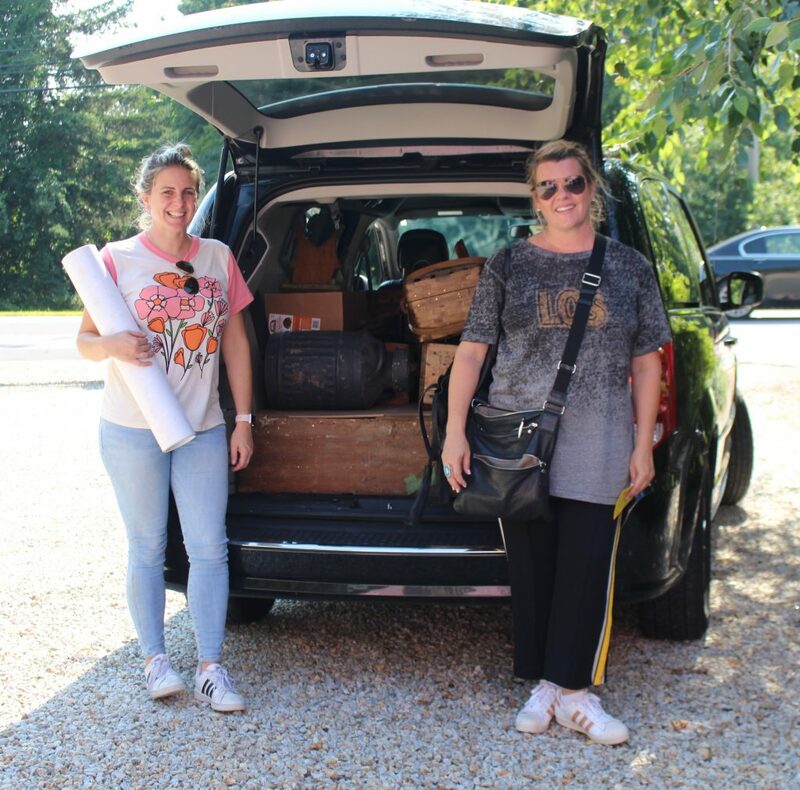 Last week, I blogged about our visit from the set designers of the upcoming Mark Wahlberg film Wonderland. Set in the Seventies, the Wonderland decorators bought vintage beer advertising & barware, a taxidermy salmon, wooden signs, and an old porch glider (among other things). This week, we were visited by the set designers for the upcoming Columbia Pictures film “Little Women” directed by Greta Gerwig (“Ladybird”). These ladies are staging Victorian interiors, a 19th century publishing house, an art studio, a NYC street scene, and formal garden party. 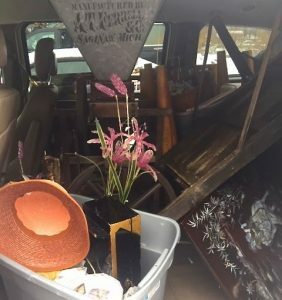 They filled their car with quilts, baskets, industrial spools of yarn, ironstone, a tin paint box, old paint brushes, and wooden crates. They’re sending a truck for milk cans & furniture; the prop crew is coming back this week to look at old type, printers trays, leather books, and clothing; and we’re discussing rental of some higher end pieces for the garden scenes. All of these folks have been great to work with–they are enthusiastic, friendly, focused, and very open to suggestions! They left us with a “want list” of things they need by the start of filming in October so we will be on the hunt to see what we can come up with in the next month or so. 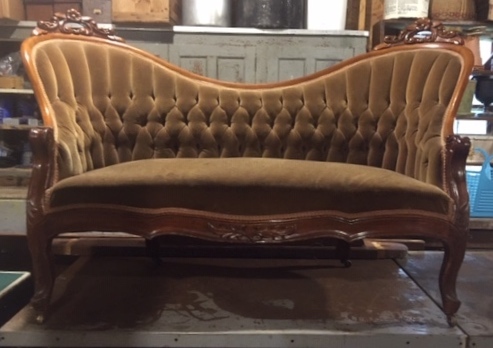 And by the way, we just read that the actors who were in talks to star in the film included Meryl Streep, Emma Stone, and Saoirse Ronan, so if we do rent some of our garden pieces, our customers may be able to buy a Victorian chair that Meryl Streep sat in! We’ll keep you posted! 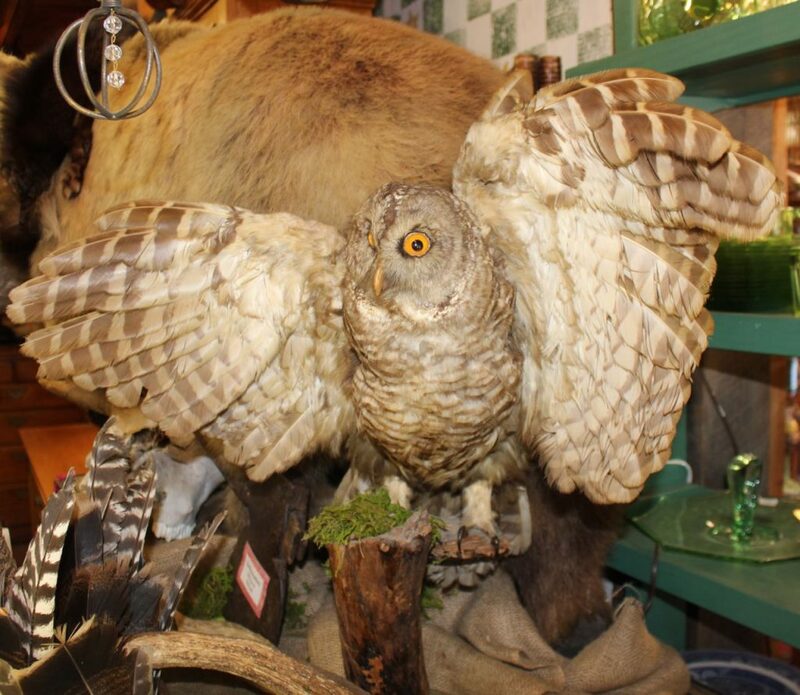 If you’ve been in our shop lately, you know that we buy and sell a lot of antique taxidermy. There are state and federal regulations with regard to buying, selling, and possessing taxidermy so it’s important to understand the laws in your state before buying “stuffed animals.” In the state of New Hampshire, the general rule is that taxidermy is allowed as long as the animals were not obtained illegally and are not protected. This is a current list of New Hampshire’s Endangered Species. Creatures protect by federal laws include birds that are part of The Migratory Bird Treaty Act. Other protected birds include birds of prey, like eagles and owls. In fact, possession of taxidermy eagles and owls is illegal in many states even if the piece was created before the laws were enacted. In the case of our owl, we contacted the New Hampshire Department of Fish & Game for permission to display her in the shop. People ask lots of questions about vintage clothing & how to care for it. Here are my answers to the most frequently asked questions. 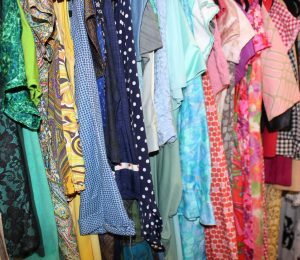 How do I clean vintage clothing? I generally recommend hand-washing vintage clothing. Start with a gentle detergent and move into more aggressive cleaners only if necessary. I use Oxi-Clean Versatile for whites & colors. I use bleach only as a last resort as it can deteriorate fragile fabrics. Is there any way to help a sticky zipper? Yes, there is! Just run an old-fashioned pencil up and down your zipper–graphite is an excellent dry lubricant and will get that sticky zipper working like new. Where do I find replacement buttons for my vintage garment? In short, the easiest thing to do when a vintage piece is missing a button is to replace all of the buttons with an appropriate substitute. Finding an exact match can be impossible. How should I store my vintage clothing? First of all, no wire hangers. I use flat velvet hangers in my shop but only because I can fit more clothing on my racks with flat hangers. Padded hangers are ideal and flat storage is best for anything heavy or beaded. What’s the best way to repair vintage clothing? It depends on the issue but in general, I always repair by hand. Seam splits can be easily repaired by hand as can button holes. Tears and deterioration are hard to fix. Tears in solid fabrics can be repaired from the inside by using a piece of fabric for reinforcement. Sheer fabrics are harder to fix. I save trim, appliques, fabric flowers, and other bits & pieces because sometimes the easiest (and prettiest) fix is to cover the problem area.